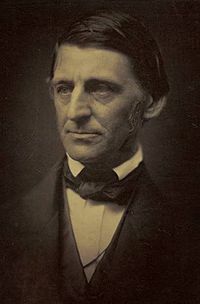 Ralph Waldo Emerson is the author of many well-known sayings - "Build a better mousetrap, and the world will beat a path to your door" being perhaps the most famous of them. When he was creating this particular aphorism the American writer and thinker had actually hoped to say something pithy about squirrel-proof bird feeders, but even his metaphysical philosophy could not transcend (ro)dental machinations -- so he gave up and went for the easy winner. Now -- almost 130 years after Emerson's death and 30 years after Mars I and began feeding our local feathered friends (and by definition our native tree-dwelling rodents as well) -- Emerson's epigrammatic enigma has been solved. Twice! 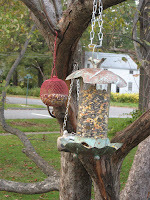 We started back then with one basic "Droll Yankee" bird feeder -- sunflower seeds, plastic tube, metal perches -- handy for the avian guests who queued up on the surrounding bushes waiting for their turn, and a sitting-duck to the ravenous rodents who gnawed though the polyethylene, inhaled the black, oily kernels, and sharpened their teeth for more damage on the stainless steel. After several identical replacements our son Bram gifted us with a "soda-bottle" feeder, which used the aforementioned container as the seed-holder on to which a metal feeding perched was screwed. The plastic therein also fell victim to the tree-rats at about the same rate as their more expensive predecessors -- but were instantly replaceable, thanks to an endless supply of empty soft drink containers that we collected from relatives and friends. I was losing each battle, but figured that, based on the law of large numbers, I was winning the war. 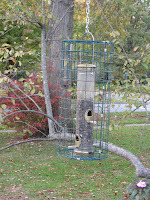 Then, last Christmas, our brother-in-law gifted us a "squirrel proof feeder". And it actually was, for almost four months. I retired the soda-bottle feeder. 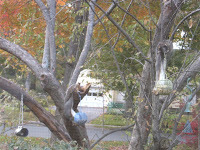 Then, as documented in this space on 4/26/10, the squirrels once again emerged victorious. But now, having temporarily experienced the thrills and excitement of a safely secured feeder, I did not want to return to my routine of thrice-weekly bottle replacement. I looked online. But I could not find anything that satisfied my singular stringent specification -- no plastic in any place that the squirrels could, in any way, reach. So I drove across the Connecticut River to our neighboring town of Glastonbury to visit the Wild Birds Unlimited emporium. While I browsed and got over my initial sticker shock, I eavesdropped on a conversation between another customer and the store manager. The topic was a partially eaten "squirrel proof" feeder that the client had brought in to see if it was repairable. It was -- and perhaps was even under warrantee. I wondered, who was more delusional -- the purchaser who believed they were actually getting something impregnable to tree-rats, or the manufacturer who imagined that they would not have to honor every single guaranteed product? When my turn came we talked about my one steadfast requirement, and jointly came up the "seed tube within the cage" solution. 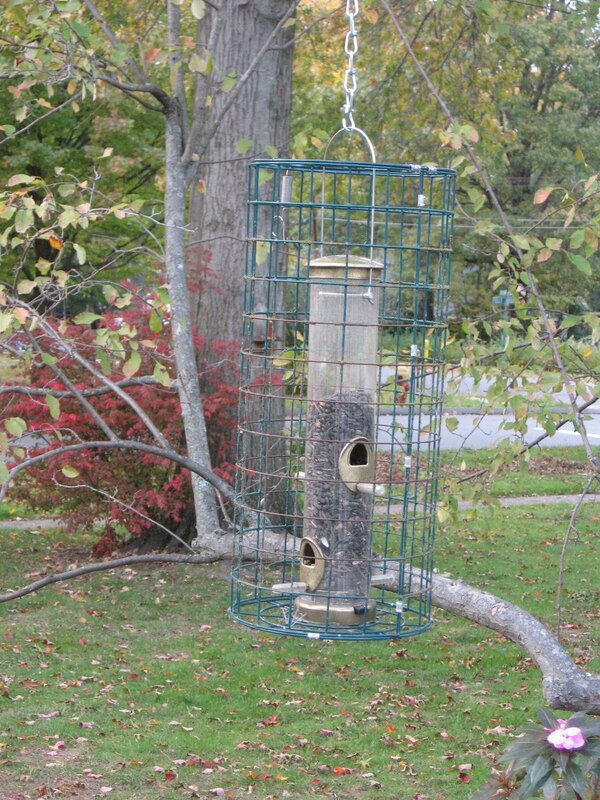 I selected a plastic feeder with a metal top and bottom, and a metal cage of compatible height that was wider enough so as to make the seed-holder unreachable. 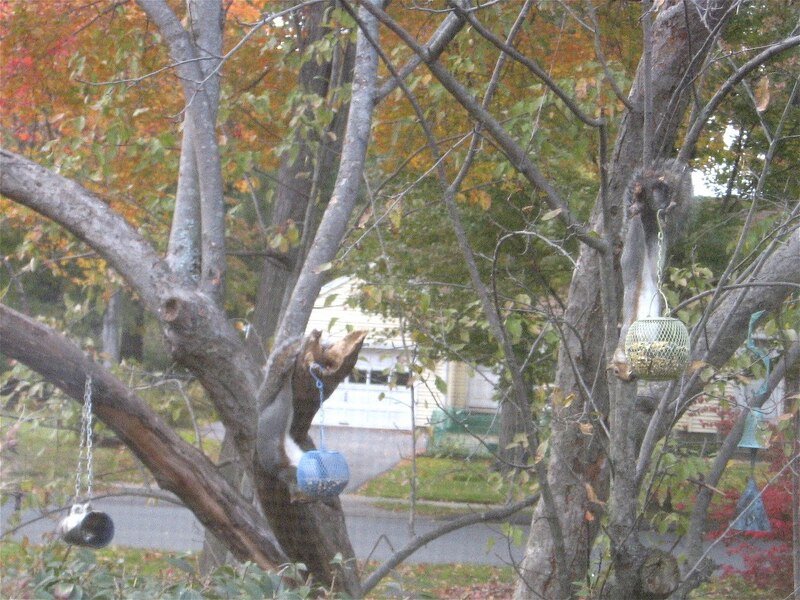 Then, two weeks ago, our neighbors across the street gave us a "Critter Feeder" and a bag of "Critter Food". The eating station has a metal top and bottom with a glass cylinder between them. The feeding holes at the bottom are designed to accommodate big chunks of food (unshelled peanuts, large corn kernels, etc.) - all of which are contained in the critter mix. It is, in short, an indestructible eatery tailor-made for squirrels. On any given day we have between four and six of them cavorting on and around the flowering crab tree from which our feeders hang. So I intentionally placed the new "critters only" restaurant right between the caged feeder (which the tree-rats are still attempting to decipher) and the three hanging metal ball cage eateries (at which they now do their dining) -- right where they could not possibly miss it. As if they needed the help. It has been over a week now. The food is disappearing at a rate of fifty percent per diem. And not one bushy-tailed rodent has dined at it. Zip, zero, nada, nil! Birds by the score -- but no squirrels. Titmouses -- but no tree-rats. Feathered creatures with beaks smaller than any morsel of food -- but nothing furry with pouches larger than the feeder itself. Dual squirrel-proof feeders. One could be an aberration. Two is definitely a trend. "Only an inventor knows how to borrow, and every man is or should be an inventor." Whenever and wherever Mars and I travel we like to eat the local cuisine. It is a major part of an area's culture, and it tastes better than most other aspects of the the lifestyle. On the Mediterranean island of Malta we dined on thin crust Maltese pizza topped with a fried egg, and indulged in Lampuki (known in other circles as dorado or mahi-mahi) -- the "national" fish. Both dishes were accompanied by "chips" (French fries) -- an culinary homage to the country's historical ties to Great Britain. In Barcelona Spain we ate ourselves silly on Tapas such as Albóndigas (Meatballs with sauce), Chopitos (battered and fried tiny squid, aka puntillitas), and Aceitunas (olives, sometimes with a filling of anchovies or red bell pepper). We knew about these tiny plates before we arrived. We did not know about 'Pa amb Tomaquet', also known as 'Pan con Tomate', or 'Pan a la Catalana' - bread with tomato rubbed over it, and seasoned with olive oil and salt. Mars and I discovered this entrée, as we did the Maltese pizza, at our very first meal in that locale. We explicitly ordered the pizza and knew what to do with it when it arrived. The four separate ingredients for the tomato bread however, were placed in front of us, without comment, when we sat down. And we figured out what to do with them by watching what everyone around us was doing with their own "Construccion Pan con Tomate " kits. In Budapest there was of course homegrown Hungarian Chicken Paprikash made with homegrown Hungarian paprika -- the signature spice of that country's cooking. The big hit with both of us however were "palacsinta" (fried pancakes) served with ice cream and toppings at an outdoor café which we found ourselves drawn to for a frozen dairy lunch on several occasions. We visited Florence, Italy with the intention of seeing Michelangelo's David and experiencing cinghiale alla maremmana (wild boar stew). The Eurasian pig endowed the meat and vegetable dish with a sweet, nutty flavor. And the statue was just, well, endowed. And now, having just returned from a two week hiatus in North Carolina, Mars and I are experiencing SFW -- no, not "Southern Food Withdrawal" but "Saturated-fat Withdrawal". We have been making the auto trip from the Nutmeg State to the Tarheel State intermittently for the past twenty-five years. And unlike our reasons for taking the aforementioned out-of-the-country jaunts, we return here for the familiar -- the beaches, the sun, the golf, and the food. Every road trip requires pit stops. And our first such respite on day two of the trip always occurs at Stuckey's on the Lankford Highway (US Highway 13 & State Road 689) in Mappsville, Virginia. "A little magic, a lot of hard work, and an American tradition is born. Why does a classic become a classic? When W.S. Stuckey, Sr. opened his Georgia pecan stand in 1937, his recipe for success consisted of melt-in-your-mouth treats (our world famous Pecan Log Roll speaks for itself), fun gifts and souvenirs, and the simple belief that nothing was more important than making - and keeping - the friendship of American travelers generation after generation." Its imminence is announced by a series of billboards, the first of which is forty-five miles in advance. Verbal visions of Pecan logs, fireworks and Virginia Style Hams are proffered to the bored motorist -- along with gasoline and clean rest rooms. But that's not why we stop. 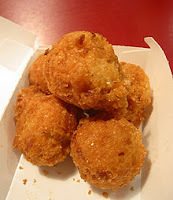 Stuckey's is the home of Hunkey Doreys - the entry point into the Saturated-fat Zone. "Sweet and scrumptious, this mouth-watering Pecan Almond Buttercrunch Popcorn is absolutely wonderful and finger-licking good." There is a reason that food that's bad for you is so popular. It tastes so good. We actually had stopped at Stuckey's several times before we were turned on to Hunkey Doreys by a co-worker at our former place of employment. With our first bite we instantly regretted all those years of gustatory ignorance. On this particular southward junket we limited ourselves to one 9-ounce canister. Spaced properly it eased us into the SFZ without shutting down our arteries too quickly. And still left some to nibble on when we completed the seven-hour drive from Mappsville to Emerald Isle, North Carolina - deep in the heart of saturated-fat country. Restaurants at this Oceanside area are known for their abundance of fresh fish -- and their hushpuppies. Well, shut my mouth! They are good! The local eating establishments are also known for their almost total lack of fresh vegetables (even the better ones serve them from the can) -- with the exception of "slaw" and fried okra. For two weeks these two veggies and fried cornmeal were the Holy Trinity of my vacation diet. If only real life were so simple. On our way home we swung into Stuckey's for some more Hunkey Dorey. We will devour it slowly over a several week period. Don't want to take a chance on getting the bends -- saturated-fat rapid decompression sickness. I am constantly on the lookout for real-world Haikus – appropriate expressions that unintentionally translate directly (with perhaps a just little editing) into that particular form of Japanese poetry (17 syllables in three phrases of 5, 7, and 5 respectively). This is especially true on vacations, where Mars and I deliberately expose ourselves to new things, and have the time and energy to study them. Alas, our recent trip south to North Carolina uncovered no such metrical gems. There was however one billboard sign alongside a rural small town road that I thought held promise, until I counted the syllables. When I got home I started Googling to see if there was a way to make something out of this group of words that I had been given. Surprisingly there are actually other forms of poetry – who knew? And with a little work I found one - English Hymns - into which my newfound phrase could be fitted. There are three meters within this genre – each one identified by the number of syllables per line, and by the rhyme scheme. My found utterance fits perfectly into the middle two lines of the short meter. So here is my first English Hymn entitled “Favorite Outdoor Slogan Sighting of the Moment”. "Honk if you love Jesus. When I saw that bumper sticker there, I didn’t think twice. My hand went for my horn, And I pushed it with conviction. When I saw that lady’s finger, It almost put my heart on ice. To read those one line sermons In bright yellow, black and white. And forgive me Lord, for saying, But my faith is weak tonight. You say, ‘Maybe it’s a rental. She could be the second owner. As a sign the world is doomed, And we’re that much closer to The End. 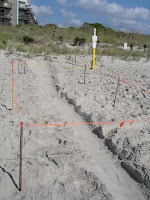 We had to return home from Emerald Isle, North Carolina before hatching time -- so we missed this year's march of the sea turtles. The potential incubation site was at the foot of the sand dunes, about twenty feet east of the weathered wooden stairway that leads down to the beach from the condominium complex at which Mars and I spent two warm, sunny weeks. The area was demarcated by one strand of yellow plastic crime scene tape wrapped around four firmly planted wooden sticks. 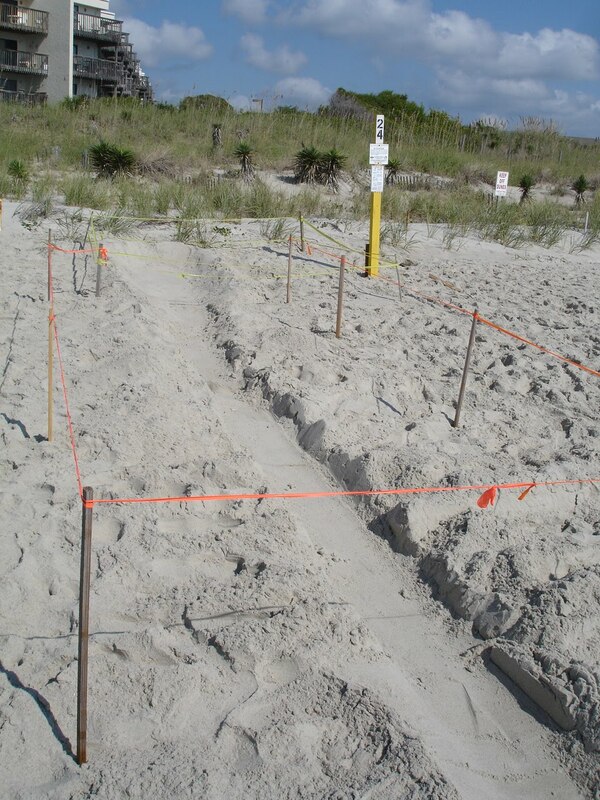 A nearby sign attached to a yellow plastic pillar by the North Carolina Wildlife Resources Commission Sea Turtle Protection Program told the reader "Because sea turtles are protected under the Endangered Species Act, it is unlawful to harass, harm, capture, or collect sea turtle eggs and live or dead hatchlings, juveniles, and adults. Violators can be prosecuted under civil and criminal laws and assessed heavy penalties." One of the permanent residents at the complex of buildings told us that the eggs were scheduled to hatch between 50 and 60 days after being laid. The birth rate can be anywhere from one to one hundred. It being the 53rd day when we were being told this, volunteer "nest sitters" would soon begin setting up nightly campouts at this location -probably that very evening. They didn't. But the next day (Thursday) we checked at 7:00 p.m. and found a group of four barefooted women in shorts and tee shirts sitting in low-slung web beach chairs alongside a manmade foot high trench. They had scraped out the sand pathway in order to direct the newbies towards the ocean. Frankly I was disappointed. I had hoped for more of a SWAT team look with dark uniforms, ski masks, forehead laser lamps, and night vision goggles. And I was even more disheartened by the failure of the hatchlings to hatch. Apparently adhering to some schedule of their own, rather than our vacation dates, the little fellows failed to materialize during our stay. We visited the location every thirty minutes that evening - interrupted by a trip to the DQ for Blizzards and the season opener of "Bones -- but nada appeared. At around 9:30 the rescue team called it a night, and so did we. On Friday we followed roughly the same schedule - minus the sundaes and choice of TV programming - and so did they. The next day we left for home. But while the amphibian beach fauna was not nocturnally appearing, the courtyard flora was - although it took me a while to catch on to what was happening. Every morning at around 7:30 a.m. Mars and I walked over to an adjacent convenience market to get the daily newspaper. The grounds of the condo are landscaped with a mixture of southern perennials and annuals along the pathways between the units, and a combination of prickly pear cactus and white trumpet-shaped flowers on squash-like vines along the sides of the driving area. A few evenings into our getaway I noticed that the large white flowers were still wide open well after dark. Then, one day around 10:00 a.m. I noticed that they were closed up. Mars, who had observed all of this strange plant behavior days before, opined that they looked to be a form of Datura -- a shrubby annual plant that we had previously seen in New Mexico (along with the prickly pear cactus). It contains toxic or narcotic alkaloids and is used as an hallucinogen by some American Indian peoples. 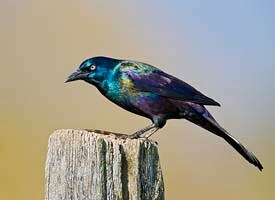 The Carolina species apparently was the dusk to dawn version of the plant -- sort of a "Deadly Nightshift". 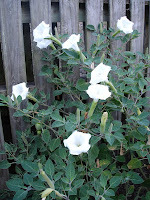 When I got home I typed "white trumpet night flower" into Google. "The Datura, or bush moon plant has six-inch or larger white trumpet flowers that open at night and remain open well into the following day... Keep in mind that all parts of this plant are poisonous." Datura are a favorite of the "Night Gardening" movement -- the use of plants that either bloom exclusively at night, or are open during the day but do not release their scent until evening. Perhaps Mars and I should have spent the time after dusk watching the trumpets unfurling rather than the terrapins not birthing. Or maybe we could have combined the two by smoking some of the former and visioning the latter. Who knew? 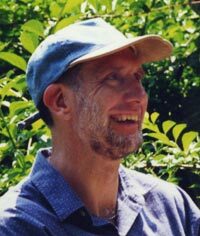 We did walk on the beach in the dark one morning at 6:00 a.m. We were under a full "Harvest Moon", but earth's natural satellite was too low in the sky at that hour to provide any meaningful illumination. The sun began appearing about fifteen minutes into our journey, slowly emerged from behind the horizon-level cloud cover and turned into the bright orange orb that we hoped we would see. Forty-five minutes later the shore was bathed in daylight and we returned to the condo. The turtles presumably were still sleeping and the Datura was probably beginning to turn in for the day. We took our final trek on the beach on that last Friday afternoon around 2:30. The tide was the lowest it had been on any of our previous jaunts. And the sands were busier than prior days with the early influx of weekend vacationers. Several fishermen were tending lines cast out into the surf and we tried to be aware of them as we strolled between the anglers and the water. We had become pretty adept at spotting the fishing string after two weeks of daily (sometimes twice/day) shoreline hikes. Usually we could see it emanating from the top of the fishing rod and, by squinting our eyes, follow its progress out to its point of intersection with our path. Occasionally we espied its entry point into the ocean and worked back from there. And once or twice we didn't see it at all until it suddenly loomed in front of us - inches away and rapidly approaching. But this time we both simultaneously saw the seemingly disconnected middle section of one strand of floating filament, glistening in the sun, suspended over the sand. A moment in space and time untethered from its past and its future -- like a good vacation.